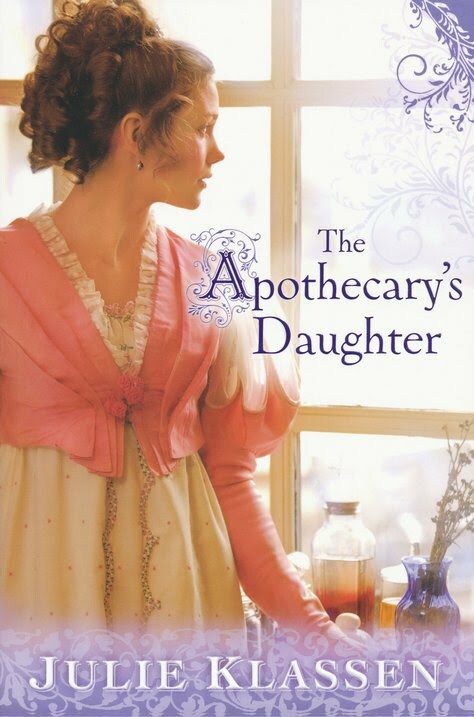 While working in her father’s apothecary shop in the small village of Bedsley Priors, Lilly Haswell dreams of one day traveling the world, perhaps even finding her mother, who had left her family three years before and has never been heard from since. When the chance to live with her maternal aunt and uncle is unexpectedly offered to her, Lilly sees the opportunity for a new life. Once in London, she indulges in a bit of romantic flirtation with several different men while also learning more about her mother’s mysterious disappearance. Then, when a crisis forces Lilly to return to Bedsley Priors, she faces the difficult challenge of giving up her fabulous independent life in order to help out the family she has always loved. This is the second book by Julie Klassen and since I loved her first one I thought it would be very difficult for her to surpass it, but I have to say this may be even better. Like The Lady of Milkweed Manor, this book contains a lot of period details and information about the apothecary's trade (which, as everyone who has watched Friends knows, means pharmacist). But this is the least of this book's charms. One of the most prominent themes of this book is friendship. Family, too and generally the concept of loyatly and love and caring for others. I loved how the heroine's friendship with her handicapped best friend was portrayed. Lilly has many suitors and one of the main themes of the book is her challenge to choose between them. Gradually their real character emerges through circumsatnces and she is ables to discern who is really good and who just makes a show of being good. She is finally ables to see beyond the surface and this makes her choice even more worth the wait and the guessing on the reader's part. That was very interesting, since the synopsis of the book had prepared me fro a series of flirtations. But Lilly is a serious young woman, with a great burden on her shoulders and she had no time for games. I loved that. The romance plays a much greater role in this book than the previous and I think this adds to its advantage. There is also an element of mystery and the surprises throughout the book keep you turning the pages. Finally, what touched me deeply (except for the romance, of course) was that every time a miracle was needed (which was quite often) God certainly provided one, every time, although a different one than expected. The christian theme of the book is powerfully, if sometimes subtly given, and introduced in the most critical, most human moments of the plot. Klassen's got a new book out called The Silent Governess that just won the Christy award for Christian fiction. I haven't read it yet. Have you?